I participated in the SBEBB's Grateful Hearts Exchange and received an absolutely beautiful biscornu from Carol. She stitched the "Four Little Hearts" by Indigo Rose on both sides of the biscornu and she edged it with delicate seed beads. It is so pretty! My picture just doesn't do it justice. 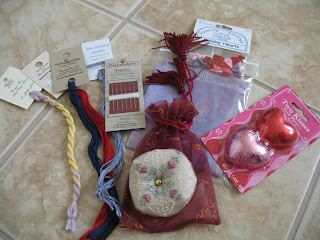 You can also see the wonderful goodies that Carol included with her lovely exchange piece. Thanks again, Carol for a lovely gift that I will always treasure. 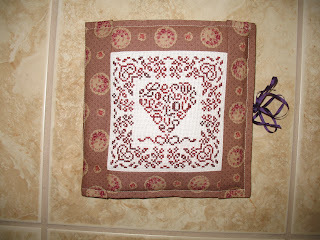 My partner for the exchange was Chris and I chose to stitch her JBW's French Country Love. I finished it as a small project keeper with a pocket. It arrived safely in the UK and Chris liked my choice. Thanks for stopping by. 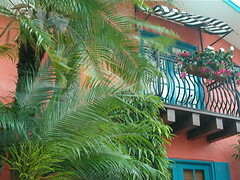 I appreciate your taking time to visit my blog. Oh my Carol did a stupendous job with her GH exchange to you! Congrats you deserve a lot of spoiling and pretty things! And yours to Chris...well it's just glorious Julianne! You are doing such fabulous exchanges!!! I can't get over it! Super, super stitching and finishing! Beautiful exchanges! I love the one you sent-great finishing. What a lovely exchange to receive! I almost signed up for this exchange, now I wish that I had! The Biscornu is beautiful and I truly love the design that you stitched! 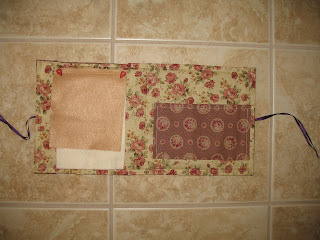 What a beautiful little project keeper you made for your partner. It's so lovley! Gorgeous exchange gifts both given and received!